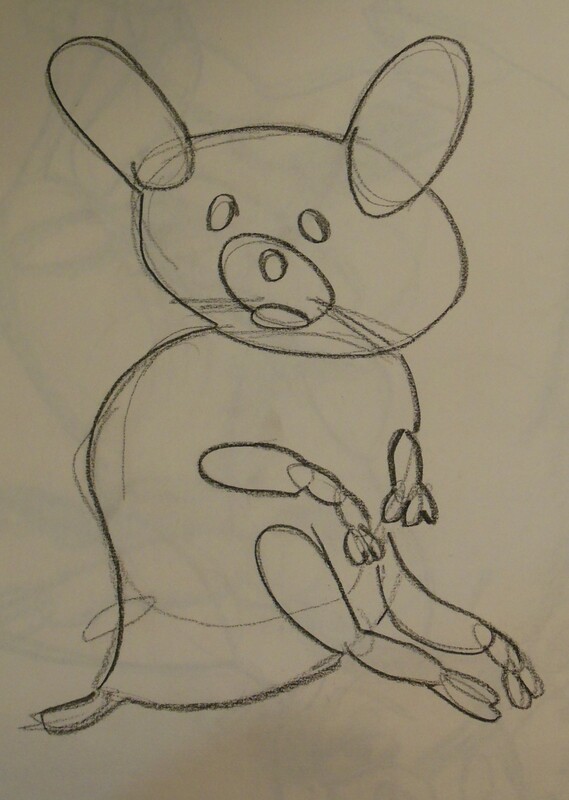 Decades ago, as a tween, I took a class at the DeCordova Museum in Lincoln, MA to learn to draw cartoon characters. While I don’t have those drawings in front of me, what I recall is that we started by sketching approximate shapes: circles, ovals, cylinders, whatever roughly characterized a face, arm, torso, belly or leg. The point was to do that initial drawing loosely in pencil, the shapes overlapping (such as where an arm met the torso), without getting hung up on precision. Each subsequent time we took pencil to paper, we refined that first doodle, perhaps adjusting the angle or size of one of the shapes. Later, we used a marker to darken the outline and add a few details, such as the direction and thickness of eyebrows, the position of the pupil in the eye, the curve of the mouth, to bring the image to life. In the current segment of my Feldenkrais training, we were again asked to imagine that both the pelvis and the head are balls, connected by the chain of the spine. My felt experience of my pelvis is anything but round and uniform. My right side is salsa-ready yet the left side can get stuck, painfully at times. Still, I tried to keep that cartoon image of a ball in mind as, over the course of the first five days, we did a series of Awareness Through Movement lessons that involved grabbing the big toe with the index finger and using the hand to move the leg and the arm in different ways, beginning from a variety of positions. As the movements became more complex, the less I was able to do. Still, simply attempting unfamiliar movements tells the brain to pick up a pencil and start doodling some new pathways. At the end of the fourth day, I went for a walk for the first time since arriving in Santa Fe (I had been driving or cycling until then). To my surprise, my pelvis suddenly did feel like a ball whose momentum propelled me forward. My legs seemed to emerge from a slightly different position in my hip sockets than before, more to the sides than the front, facilitating a rolling motion that made walking seem almost effortless. What if I had been able to traverse all 520 miles of El Camino de Santiago like that? I wondered. As I marveled at the difference, I pictured myself as a collection of simple shapes in motion. If my pelvis were a ball, then my thighs were wide cylinders, my knees circles, my shins tubes, my feet ovals. My head, also a ball, floated atop my neck. It was a relief to both imagine and experience myself as a simple cartoon figure rather than the cubist or mosaic portrait I often carry around in my imagination, a more complex picture that might be impacting how I move. While cartoons, unlike photorealistic ink or charcoal drawings, are not often deemed art, their beauty resides in their ability to convey emotion, personality and attitude with a few well-placed pen strokes. Learning where to place those strokes, and how thin or thick to make them, might be the work of decades if not a lifetime. At least my brain now has a pencil in hand and has started redrawing the relationship between my pelvis, my legs and my head. I’m curious what that will ultimately look like. Wow, don’t take offense, but you’re very lucky that, without kids, you are able to spend so much time (and money) on yourself. Your descriptions of Feldenkrais really make me want to try it. My cousin used to teach it, but he lives in Philadelphia. As for the drawing you mention, my daughter has been teaching herself the shape method from watching YouTube videos. I have this tendency to want to jump in when I see she’s interested in something and look for the “best” instructor or class she could take. I have to reign in my anxiety-provoked perfectionist behavior and remember it is about her enjoyment of what interests her, and I need to let her set the pace. She loves self-teaching using online, open-source resources. Sarah, Glad that my writing about Feldenkrais makes you want to try it. One reason I spend so many hours attempting to translate this incredible and somewhat ineffable practice into the written word is to share this experience with others and perhaps, inspire them to check it out (take a few classes, ideally) and see for themselves what might arise. As for the whole time/money issue, another trainee is the mother of a 10 year old and a 6 year old. And another is the primary caregiver to an aging parent. What I’ve noticed in life is that if someone wants to do something badly enough, they’ll figure out how or the details will work themselves out. Since Feldenkrais is about creating possibility, I’m hoping that you will consider all possibilities that might allow you to take a class. And please also consider the possibility that what I am learning in Feldenkrais is similar to what you are learning in the course of parenting (the example you gave is a great illustration).